There are those who like flaunting their success with outward displays of wealth, while there are others who are equally successful but prefer not to attract any attention. Among the pickup trucks available in the market today, the one that perfectly fits the latter’s description is the Isuzu D-Max. It may not have the same headline grabbing power as some of the other choices out there, but it doesn’t mean it’s less capable. In fact, it’s an honest-to-goodness vehicle that drives and rides very well. In terms of aesthetics, it’s hard to tell that much has changed. The D-Max enters into 2018 looking largely the same way it did. Yet, it must be remembered that just a year ago, it went through a major refresh giving it a stronger looking front-end. It’s still not as in-your-face, but there’s also no denying that it looks quite pleasant. The new hood, grille, headlights, bumpers—they all look clean, understated, and elegant. Subjectively though, the best part of the D-Max’s new getup is the wheels. The 6-spoke, 18-inchers fill in the arches handsomely. While the D-Max’s exterior remains as fresh as ever, if there’s one place where it needs some work, it’s on the inside. It’s solidly put together, well-wearing, and easy-to-clean. But it’s also extremely plasticky. The biggest culprit is the climate control system whose setup not only takes up a large chunk of interior space, but can be quite confusing to use at first. Still, the cabin’s easy to use and live with. Plus, Isuzu’s actually done some work to modernize some details here and there. The instrument cluster’s new and so is the pattern on the leather seats. The infotainment system is also fresh with crisper graphics and can be outfitted with optional tire pressure sensors. And speaking of standard features, the D-Max comes loaded with them; perhaps far more than any pickup truck in the same price bracket. Aside from the aforementioned leather seats and snazzier infotainment system, it gets power seat adjustment for the driver, a push-button start/stop system, electronic stability control with traction control, hill start assist, rear parking sensors, and a backup camera as standard. For 2018, the price has actually jumped by P 70,000 to P 1,670,000 which sounds like a lot of money, but considering that the Colorado (+ P 19,000), Ranger (+ P 69,000), and Hilux (+ P 42,000) are all priced more, the D-Max sits comfortably mid-pack pricewise. Encouragingly, the D-Max’s ergonomics are spot on. With the exception of the steering wheel (which badly needs reach adjustment), the rest of the package is solid. The front seats, though not as supportive as those found in a sporty compact promotes comfort even during long stints in traffic. It’s worth noting though that even at the lowest setting, it’s mounted quite high. This offers a commanding view of traffic, but it does feel awkward for the first few kilometers of driving. The space upfront is good despite the climate control system taking a good chunk of knee room away. The second row can actually accommodate three adults comfortably with everyone getting their own 3-point seatbelts and adjustable headrests, or if there are just two occupants at the back, they can enjoy the center armrest as well. Oddly enough, ISOFIX child seat anchors are absent but at least there are top-tethers to accommodate traditional child seats. Storage is abundant and well thought out with twin gloveboxes, a deep center console bin, cup holders on both sides of the dash, and another storage spot at the center of the top of the dash. Almost aesthetically unchanged from last year, the vast majority of the 2018 update is concentrated under the hood. It employs a new 3.0-liter 4-cylinder turbo diesel engine. Part of Isuzu’s Blue Power range, the 4JJ1-TCX engine is now Euro IV emissions compliant. It also nets a slight power bump (177 horsepower from 163 horsepower) with torque remaining the same at 380 Nm. While these figures don’t light the spec sheet ablaze, they do a fine job of making the D-Max feel motivated most of the time. Underway, the D-Max feels willing and relaxed. With peak torque coming in sooner and extending later, it’s brisk. There’s a momentary lapse in power before the turbo kicks in (below 1,600 rpm), but once it does, the momentum just keeps going. From 2,000 rpm upward, it offers a clean and smooth response along with a broad band of pull that extends past 4,000 rpm. And even at high speeds, the engine never feels taxed or stressed—a trait it’s surely inherited from the N-Series truck which basically shares the same engine. Noise, Vibration, and Harshness (NVH) is also remarkably improved from its pre-Euro IV days. There’s some clatter present at full throttle, but those who’re used to diesels will consider it fairly quiet. Accompanying the engine is a 5-speed automatic. Though it’s a carryover, it feels better matched to this engine. The shifts are smoother and less obtrusive from before. That said, an extra gear could have made it a better highway cruiser. As it stands though, it does a respectable 7.63 km/L in the city (average speed 13 km/h) and 10.52 km/L on the highway (average speed 54 km/h). As one would expect out of a pickup truck, the suspension is firm. Still, the D-Max exhibits qualities that are good for a ladder-on-frame vehicle with rear leaf springs. There’s no unwanted bucking or bouncing around even over choppy surfaces and the handling is largely sorted. It has its fair share of rolling through corners and diving under braking, but nothing alarming. The brakes also feel good and confidence inspiring. If there’s one chink to its armor though, it’s the steering. With 3.8 turns lock-to-lock, it already takes numerous tugs of the wheel to get it to turn, but add the hefty weight and 6.3-meter turning radius (one of the largest in its class), and it can be a bane through tight maneuvers such as negotiating U-turn slots and parking slots. 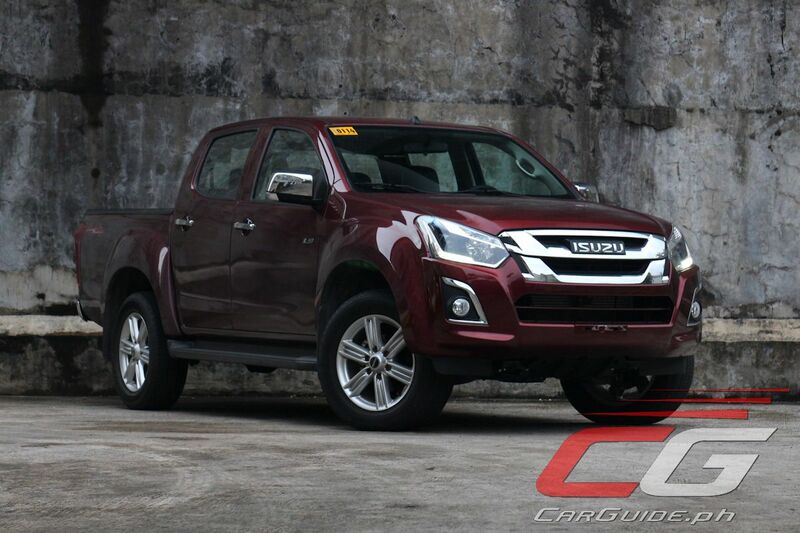 All in all, the 2018 Isuzu D-Max is certainly not breaking any molds, but the addition of the new Euro IV compliant engine is certainly a welcome update to this well-sorted, well-thought of package. While it isn’t as flashy or advanced as some of its rivals, it still remains an honest and reliable choice. Plus, it can easily handle anything life throws at it be it work, play, or adventure. It doesn’t fit the bill for those who’re looking for a flashy new toy, but for those who’re seeking to find a strong, practical, and comfortable choice, there’s perhaps no better life partner than this. Does the new Isuzu D-max 4x4 have some sort of locking differential? AFAIK, the Ford ranger has electronic locking differential. This is some important detail that shouldn't be missed if doing a review of a 4wd cars. We take the perspective of the regular car buyer and not a specialist like an off roader. If that were the case, we would have brought the D-Max at a control offroad course. That said, it doesn't have locking differentials. It has a part time 4WD with low range as indicated in the specs below. feeling race car. ang bagal bagal naman kung tutuusin. sa low range lang malakas hatak nyan. at walang kwenta yang colorado mo kung itatrack mo tataob lang yan pagnag high speed cornering. Some people can't detect sarcasm apparently. So what kung OFW? Kaysa naman tulad mong keyboard warrior na walang trabaho, inutil. Sir Uly, I know this is the 4WD version, but between DMAX 4x2 vs 4x2 EL Calibre Navara? Considering Navara is cheaper around 150-200k cheaper. Will be used mostly urban and occassional utility. Thanks. Malinis na ang Emission ng Isuzu. Available na po sa lahat ng Isuzu Dealerships Nationwide! Dahil Malinis na po ang Emission ng Isuzu. Fix Or Repair Daily, LOL. not to mention costly repairs.